Abundant sunshine. High 77F. Winds light and variable..
Generally clear skies. Slight chance of a rain shower. Low 52F. Winds SSW at 5 to 10 mph. 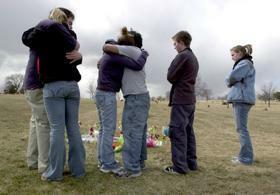 Friends of Tony Cappellano gathered to mourn his suicide at his Omaha gravesite on March 10 - his birthday. (Left to right) Alex Nelson, Molly Rich, Kathryn Gellatly, Zak Greunke, Ricky Tanner and Katie Assmann went to school with Cappellano at Omaha Westside. "He was a saint," Greunke said of Cappellano, who killed himself this past January. Here lies Tony Cappellano, his future buried under 50 cubic feet of pale Omaha dirt, smoothed flat on a wide grassy hill. Above him 68 pinwheels spin and rattle. A half-deflated Mylar balloon thumps the top of his grave in the wind. Happy 18th Birthday. Happy 18th Birthday. Over the hill and two minutes south of Calvary Cemetery lives his family  mother, father, brother  in a ranch-style home at the top of a circle. The middle-class neighborhood is where he grew up and where he decided he would die, Jan. 10 at 2:20 in the afternoon, alone in the basement bathroom. Six minutes northwest of where Anthony Michael Cappellano lies now is the school he attended. Signs in Westside High School's entryway display the achievements of students and teachers. Twenty-five Omaha World-Herald all-academic team nominees. Highest average ACT score in the metro. Most National Merit Scholarship semifinalists in the state. Highest SAT scores in the school's history. Nebraska's 2005 teacher of the year. But taped to the inside front door is another sign, one that advertises a forum on suicide to take place at the school March 22 for students, parents, staff and community members. Two Westside senior boys, one of them Tony, killed themselves four months apart this school year. Suicide can result from a complex mix of problems, which frequently include depression. But a significant factor in Tony Cappellano's decision to die, say family members and the private counselor who treated him, was the bullying he endured by a handful of classmates at Westside High. The letter fills 27 lines. In it, Tony takes all the responsibility for what he is about to do. It is not God's fault, he writes, not his parents' fault, not his school's fault. His counselor didn't fail him. He just stopped caring about the things he once cared about, he explains. The sadness people would feel if he ended his life became less important. He acknowledges the selfishness of his reasons. A shroud of depression blocked Tony's view of the positive things in his life: loving parents and brother, caring family and friends, a bright future, a world that needs all the Tony Cappellanos it can get. He had been depressed, probably since fifth grade, said his counselor, Amanda Duffy Randall. But the bullying he experienced at school played a huge role in his life and death, she said. He wanted to be the happy kid he once was, accepted by everyone. He couldn't endure that a handful of kids had turned on him  he could tell you the exact moment it happened in his sophomore year  and try as he might, he could not win them back. Their taunts and teasing punished him every day. "Tony was especially vulnerable to it," she said. "He was a very approval-seeking kid, period. The bullying had untold effects on him." He was a young man hungry for attention, she said. "In Tony's case, what's scary is that he was from the most loving, enveloping, caring family in the world," Randall said. Physically, he was not different from many other boys his age. How tall, what weight, with brown eyes and dark hair that showed his Sicilian heritage. He had played several sports at Westside. Tony's tenderness and eagerness to please may have captured the attention of boys who got their fun in making fun. He had never understood why people would say mean things or would hurt other people's feelings. "Combined with his depression, it really made him vulnerable," she said. He ruminated on the slights he received at school. He went home for lunch or didn't eat because he couldn't walk into the cafeteria with the two-story wall of windows and risk running into the boys who would call him names or throw little wads of paper at his hair. "I don't think most of his friends had a clue about the distress he was in," she said. "He would put on a smile everyday and go to school." In his sessions with Randall, they talked openly about suicide. The Catholic teenager wanted to know if it was a mortal sin. "Yes," she told him. "It is." Nobody who loves you gets over it, she added. He tried antidepression medication  Effexor, then Prozac. But there was an abyss in his melancholia that no one  and no treatment  could reach. Because God knows, they tried to pull him out. Students in schools from one end of the country to the other daily experience or witness name calling, teasing and bullying. Studies, surveys and crime statistics show nearly one-third of young people are bullied at least once a month. Sixty percent of U.S. teens witness bullying at least once a day. Many students report harassment or bullying on school property because of their race, ethnicity, religion, gender, sexual orientation or disability. Victims of bullying are more likely to suffer physical problems, such as common illnesses, poor appetite and sleep deprivation. They're more likely to be depressed and suicidal. The effects of bullying can last far after high school graduation. In his book, "Real Boys Voices," William Pollock writes that at the top of the list of what boys across America talk about are teasing, bullying and the need to fit in. Boys' abuse of each other ranges from verbal taunts to physical threats to lethal violence. "It is a constant and widespread problem that is insidiously eating away at the quality of life of many American boys," Pollock writes. "It is a life where they cannot let their feelings show and dare not flinch, for fear of ending up humiliated, seriously injured or dead." Bullying is, he says, "nothing less than a national disgrace." Some Nebraska school districts have antibullying policies, but not all. The state Board of Education encourages local school districts to establish policies and strategies to "emphasize and recognize positive behaviors that promote a safe and secure learning environment for all students and staff." State Sen. Gwen Howard introduced a bill this session in the Legislature that would have required every school district in Nebraska to adopt an antibullying policy. The bill didn't make it out of the education committee. "It's unfortunate," Howard said. "People are very aware there is a problem that needs to be addressed." The committee gave the bill quite a bit of discussion, she said, but her motion to move it out of committee died for lack of a second. "Where I feel it really broke down was from resistance of school administrators and school boards," she said. Their state associations delivered the message that they didn't want a written mandate for the policies. The Nebraska Council of School Administrators conducted a survey of its members in 2003, when the state Board of Education was considering how to address bullying policies in state schools. The majority of more than 300 school administrators opposed any type of bullying policy, according to an article in the association's newsletter that year. "Bullying is not an issue that needs to be specifically addressed." "Kids tease, adults tease. Bullying is a gray area." "Not all districts/schools have problems with bullying." will not eradicate bullying. Have they forgotten what growing up is like?" "Once again, meaningless mandates which may only apply to Lincoln and Omaha." The Legislature's Education Committee chairman, Sen. Ron Raikes of Lincoln, said committee members think bullying is an important issue, but they didn't feel requiring districts to adopt policies would cure the problem. To require staff training for bullying prevention is an unfunded mandate, he said. School districts have an assortment of policies on antidiscrimination and harassment that might serve a similar purpose, he said. But Howard will not give up. "I'm dauntless," Howard said. "I fully intend to go back in the next legislative session with another bill." Friends of Tony report he was the victim of teasing and bullying by five or six students, mostly boys. The same students bullied other kids at the school, they said. "They put him down really badly," said Zac Greunke, one of Tony's close friends. "It was really mean. They did not consider his feelings." Zac said Tony talked to him about it only once, saying how much it bothered him. "He was the nicest guy. He always thought about others before himself," Zac said. "He was too nice of a guy to stand up to them." Tony's cousin, senior Angie McCall, said the boys would sit in class and throw pieces of paper at him. They would push him, make fun of him, laugh at him. Kathryn Gellatly, a friend, said they told him he was ugly and ridiculed his hair. One of his harassers made up a name for him: "Handicappellano." "He talked to me a lot about it, how he wanted to be in that crowd, how they hated him," Angie said. Cousin Hilary Williams, also a Westside senior, said she could tell the difference between malicious teasing and kids just kidding around. The bullying she saw at Westside seemed malicious, she said. "Tony was a victim because he was  it may sound like a cliché but he was too nice," Hilary said. "He never fired back. He pretended to laugh it off." Westside recently released results of an October survey at its school to which 74 percent of the school's nearly 2,000 students responded. The survey identified the extent and nature of bullying at the school. Thirteen percent of respondents said bullying was a problem at the school. They gave seven reasons for why students are bullied, including (in order of frequency) appearance, athletic performance, academic performance, race, sexual orientation, religion or family income. Students said most of the bullying occurred in the hallways. Other most common places were the cafeteria, classrooms, on the Internet, in the community and at athletic events. A districtwide survey showed 6 percent  119  of Westside High School students were bullied six or more times and 33 percent  656  at least once. Districtwide, many students said they were concerned about incidents they witnessed but didn't report because they were afraid they, too, would be bullied. Westside Vice Principal Pat Hutchings said bullying has recently been added as No. 7 of the top 10 student conducts that can result in suspension or expulsion. "What's hard," Hutchings said, "is to get kids to report it." The school is planning to begin bullying prevention efforts once it finds an effective curriculum. The high school held a couple of open forums after Tony's death, where students could talk about their concerns with an assistant principal and counselors without fear of reprisal. Twenty to 40 students have participated, Hutchings said. "We want students to know there are people who will listen and take their concerns to heart," she said. There always will be some students who have problems in high school, she added. "Some adolescents truly don't feel welcome. That's been true through the ages," Hutchings said. "Alienation is part of the experience. We're always watching out for those kids who may feel unwanted or unwelcome." Some students have been critical of the school, which they say did not, in the wake of Tony's death, bring in crisis counselors from outside the school to talk to students and staff who were upset or grieving. In the last period class Kathryn Gellatly shared with Tony, the teacher quickly moved people around to fill his empty seat. "Someone was sitting in his desk and I was thinking, No, don't sit there,'" she said. Tony's cousin Hilary said the school seems to have learned nothing from the two seniors' deaths. "It amazes me that life seems to go on as before," she said. "Nothing changes." Kitty Cappellano knew the end of the school year was drawing near, and her son would be out of high school in just a few months. He could hang on to that and to a promising future. In July, he had gone on a fishing trip with his father and friends in the neighborhood to Pacwash Lake in Northern Ontario. The lake and the trip were dear to him. "Upon my arrival in Lake Pac Wash, I feel free," he wrote about the trip. "Stress, rules and unkind people do not exist there. Only the waves of the lake brushing up against the boat and rocking it, the soft wind blowing in your ear, and the fish jumping out of the water are there." Six months later he would take a Monday off from school, and before the end of the school day he would carry his rosary and a cross down the basement steps, take a hunting rifle from the gun cabinet, and end his life. If I had thought he would, believe me, I would have had him sewn to my hip." The temperature failed to reach zero the morning Tony was buried on that west Omaha hill. Twelve hundred people attended the funeral. "If he just could have seen this," his mother said. "People loved him. But you know what? It didn't matter to him if there were two people who didn't like him." His family and friends continue each day to struggle with Tony's decision. "I wake up every morning and live every moment of his life and death," his mother said. In a note to family and friends after the funeral, the Cappellanos said Tony had two problems: his depression and his inability, because of his kindness and sensitivity, to accept the world's harshness. "In his memory, be kind to everyone. If the world can be a kinder place because of Tony, his death will be less of a tragedy and his life even more a reason to celebrate." Reach JoAnne Young at 473-7228 or jyoung@journalstar.com. Bullying is intentional and typically repeated behavior targeting another person or group. It involves a balance of power and causes physical and/or psychological discomfort or harm. It can be a direct attack: teasing, taunting, threatening, stalking, name-calling, hitting, making threats, stealing. It can be more subtle: malicious gossip, spreading rumors, intentional exclusion. Most bullying occurs on playgrounds, in lunchrooms, bathrooms, hallways and on school buses. The incidence of cyberbullying is increasing, in online chat rooms, through e-mail and text messaging. * Ask your child directly. Take any incidents of bullying your child tells you about seriously. Talk calmly with your child about his or her experiences. Tell your child he or she has done the right thing by telling you. * Know school policies that protect students from harassment, bullying and physical violence. All students have a right to a safe and secure learning environment. * Seek help from your child's teacher, guidance counselor and school administrators. Hold them accountable for following school policy. * Understand your own child may need to change aspects of his or her behavior. * Never approach another parent directly. * Do not encourage your child to retaliate. * Notify the police or a school resource officer if your child is assaulted. * If your child becomes withdrawn, depressed, reluctant to go to school, or if school performance declines, additional consultation or intervention may be needed. Lincoln Public Schools provides physically safe and emotionally secure environments for all students and staff. Positive behaviors (nonviolence, cooperation, teamwork, understanding and acceptance of others) are encouraged in the educational program and are required of all staff. Inappropriate behaviors, including but not limited to bullying, intimidation and harassment, must be avoided by students and all staff. Strategies and practices are implemented to reinforce positive behaviors and to discourage and protect others from inappropriate behaviors.